The Department of Intangible Cultural Heritage started a research project on passing down intangible cultural heritage (traditional techniques) in FY 2014. 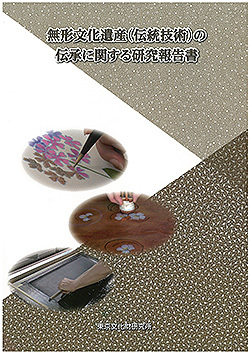 In this project, we conducted joint research of dyeing ateliers under an agreement concluded with the Kumagaya Municipal Government in Saitama Prefecture, which had been conducting a pioneering program on tools related to dyeing techniques. This report summarizes the outcomes of our joint research. This report also introduces challenges and suggestions in passing down dyeing and weaving techniques from the perspective of each craftsman who cooperated in our field study. As complementary data, this report includes interviews in the joint research, floor and elevation plans of the ateliers, and videos shot during the research. In addition to these, a round-table talk on the “Current Situations of People and Tools Supporting Dyeing and Weaving Techniques” during the workshop on passing down intangible cultural heritage (traditional techniques) held on February 3, 2015. The video material attached to this report as the first attempt of the Institute is also a repository of “skills and techniques” as intangible cultural assets. The Department of Intangible Cultural Heritage will continually promote comprehensive recordkeeping including image and other data, in addition to literal and photographic recordkeeping. The “Research Report on Passing Down Intangible Cultural Heritage (Traditional Techniques)” will be released later on our department’s page of the Institute’s website. Copyright © Department of Intangible Cultural Heritage All Rights Reserved.